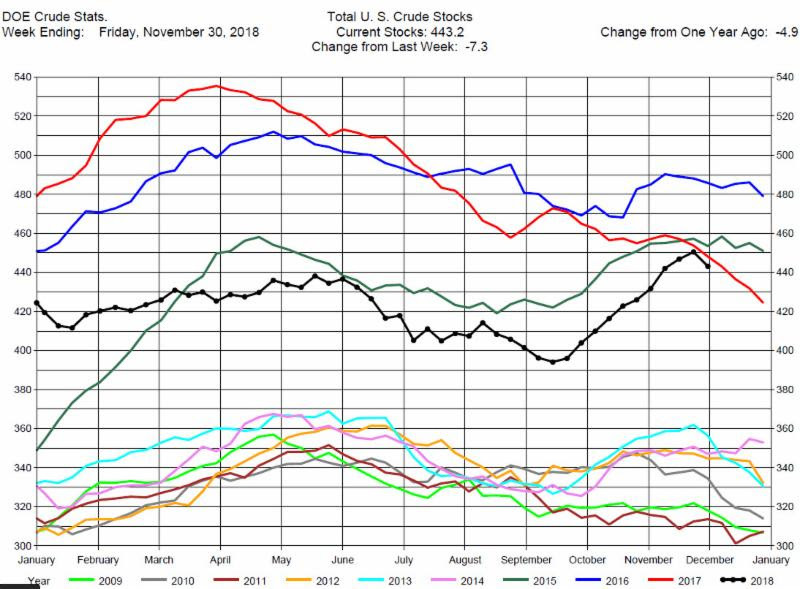 The DOE reported Total Crude Oil Inventories decreased by 7.3 million barrels to 443.25 million barrels for the week ending November 30, 2018, while expectations average was for a 900,000 barrel decrease. 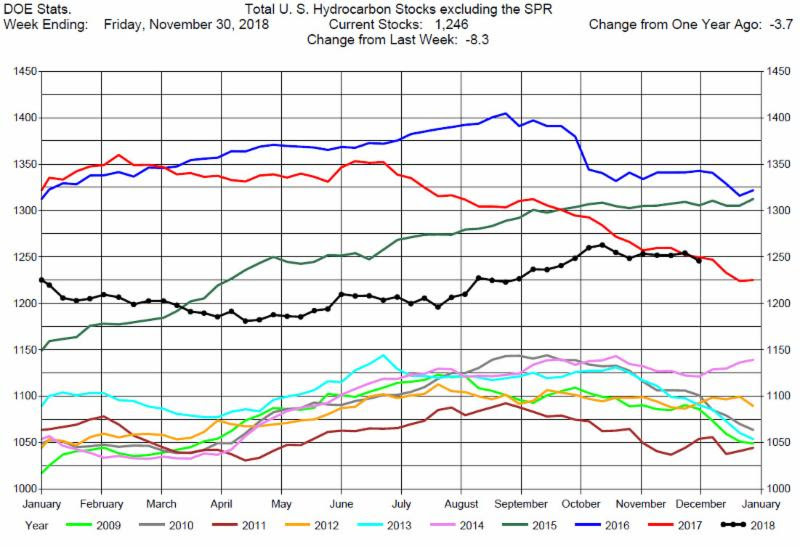 Overall hydrocarbon supplies decreased by 8.3 million barrels to 1,246 million barrels. 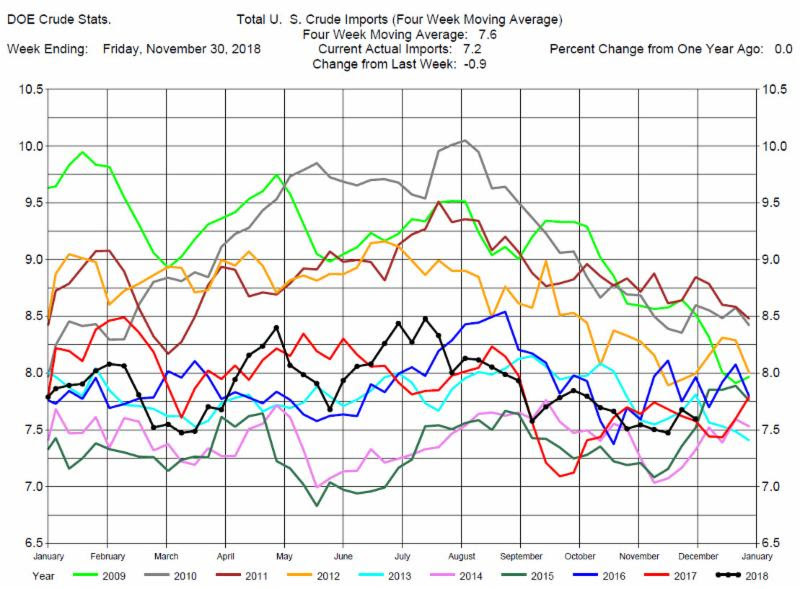 Total Crude Imports were down by 900,000 barrels per day to 7.2 million barrels per day. 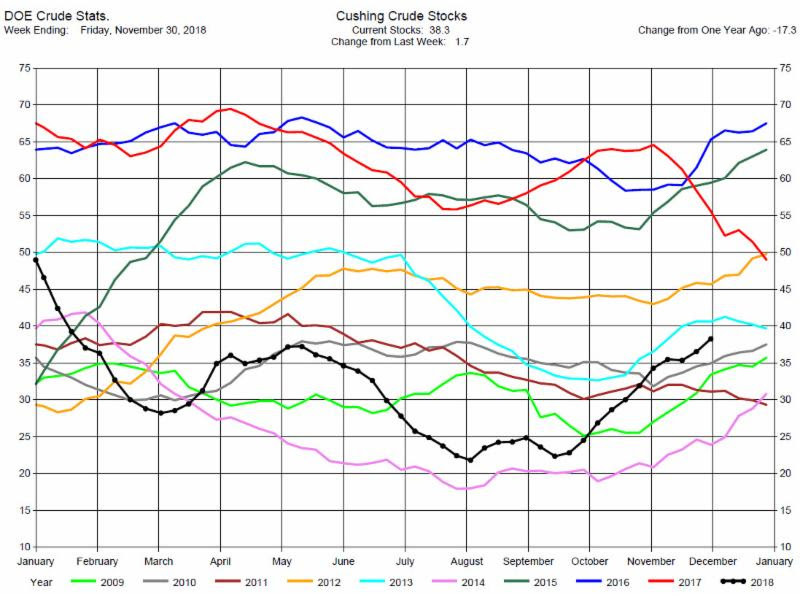 Total Refinery Crude Runs were down 100,000 barrels per day to 17.49 million barrels per day. 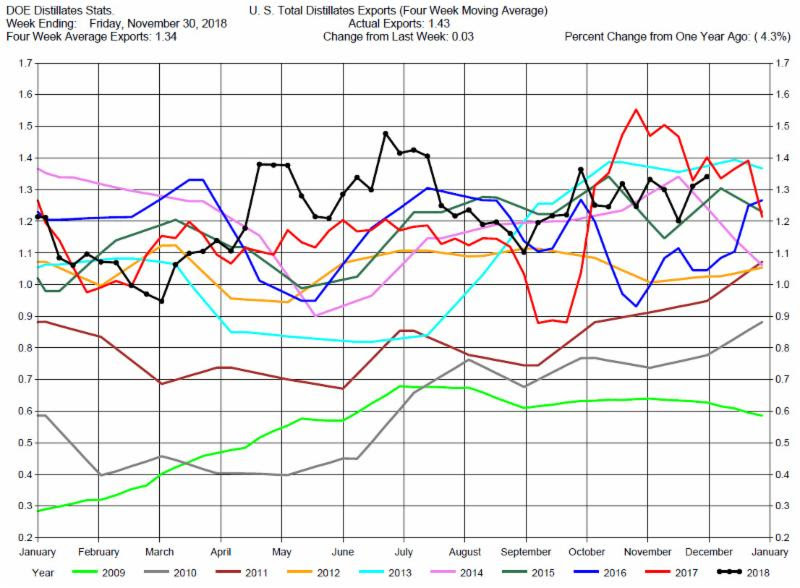 OPEC tentatively agreed to cut oil output but was waiting for a commitment from Russia before deciding volumes and that news dominated crude oil prices. 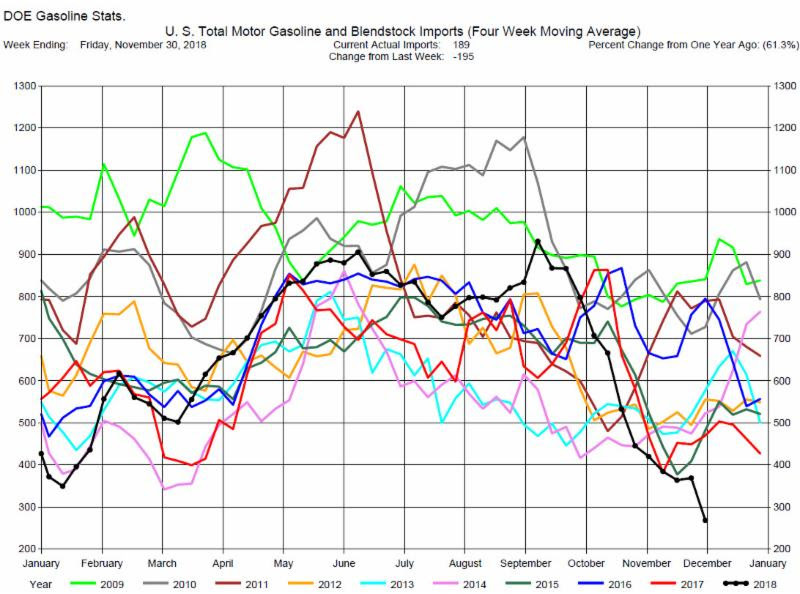 Prices were already down over $2 when the DOE report was released. 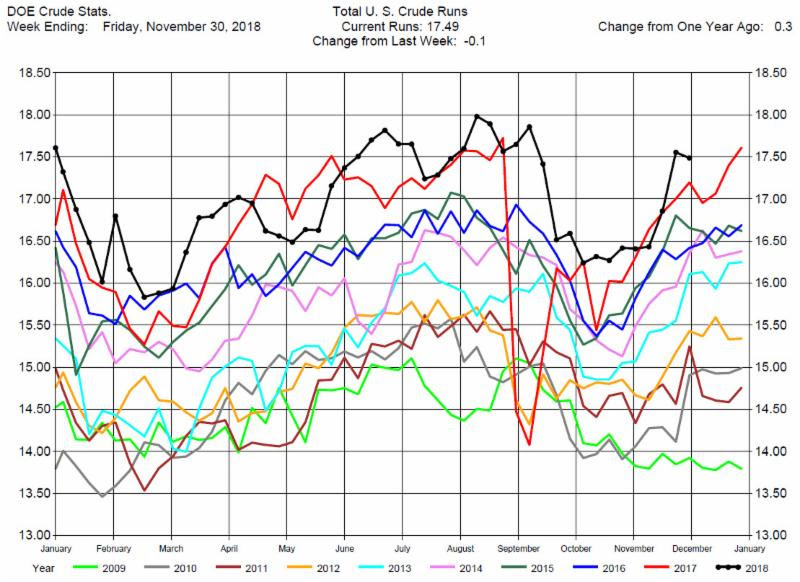 The DOE report was decidedly bullish for crude prices with the large draw in crude oil stocks and prices did rally in volatile trading. 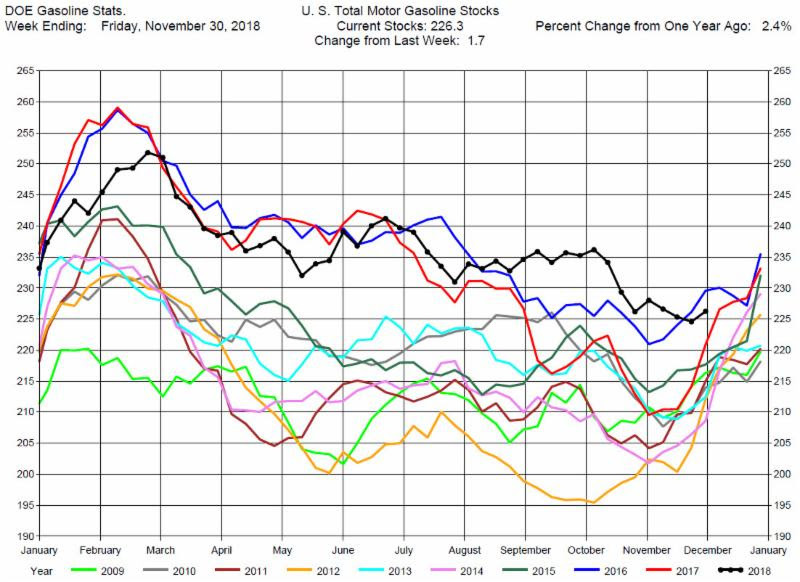 Yet, prices were still down by over $1 by the end of the trading day. 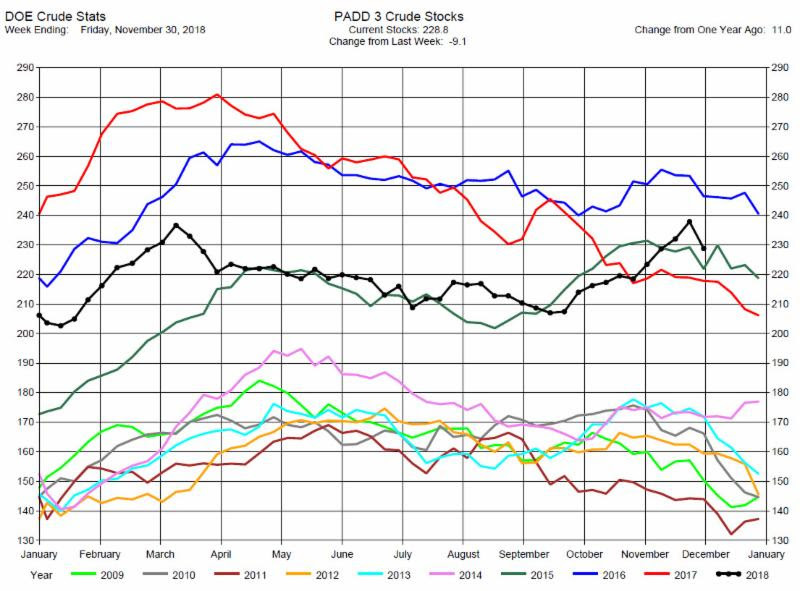 This is still a bear market for crude oil, but prices are driven more by headlines than fundamentals. 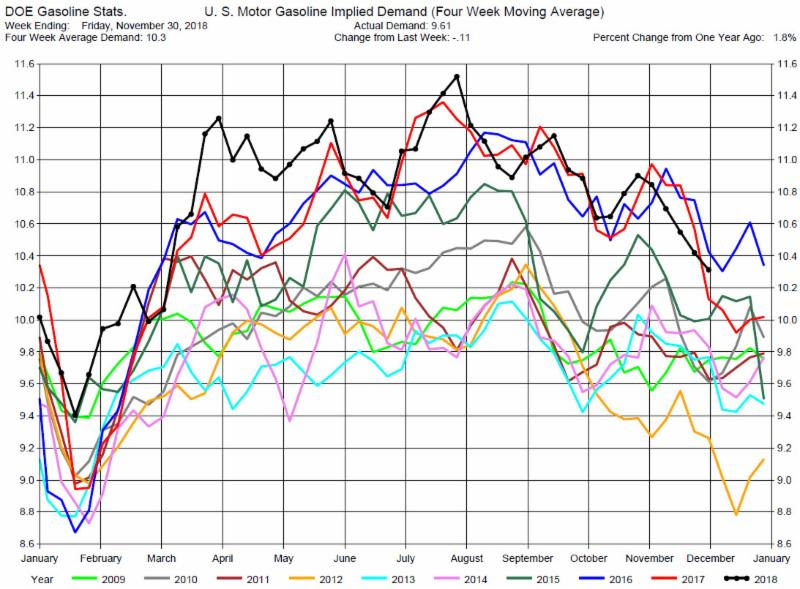 Implied Demand was down by 110,000 barrels per day to 9.61 million barrels per day. 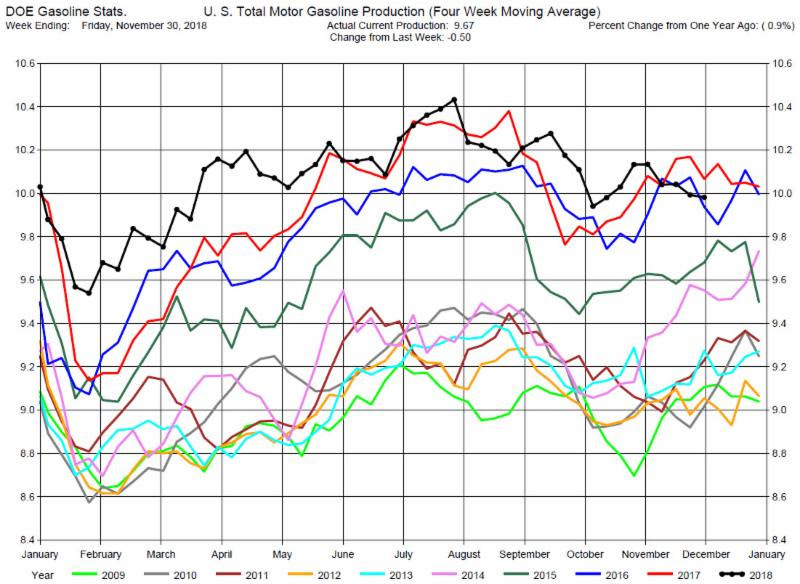 Gasoline Production was down 500,000 barrels per day to 9.67 million barrels per day. 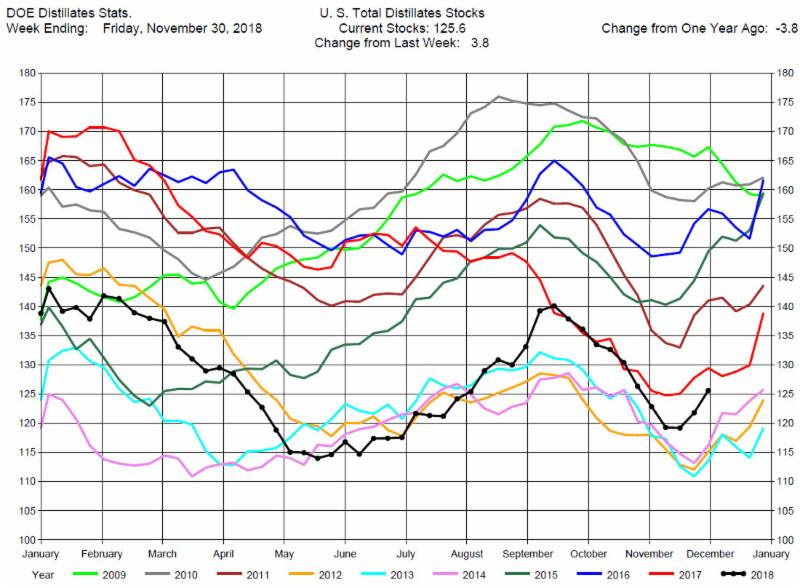 Total Distillates Stocks increased by 3.8 million barrels to 125.6 million barrels for the week ending November 30, 2018, while expectations average was for a 1.2 million barrel build. 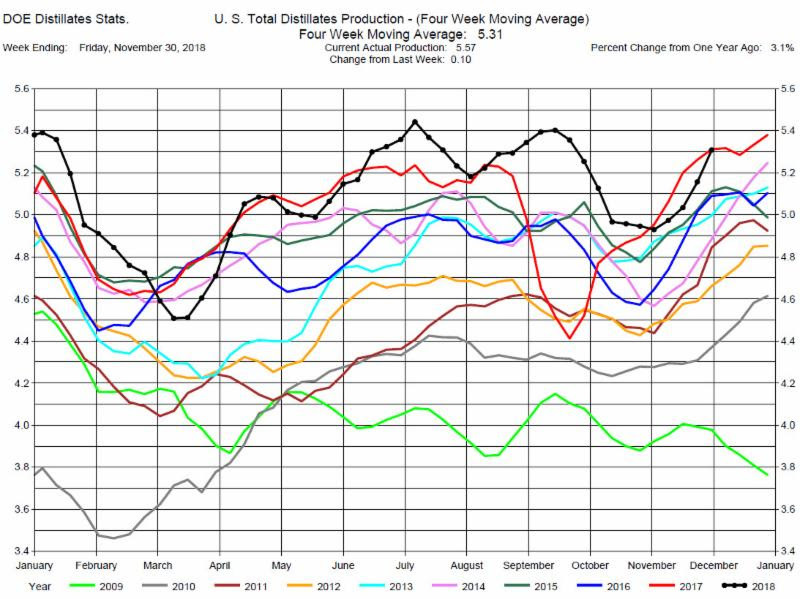 Total Distillates Production was up 100,000 barrels per day to 5.57 million barrels per day. 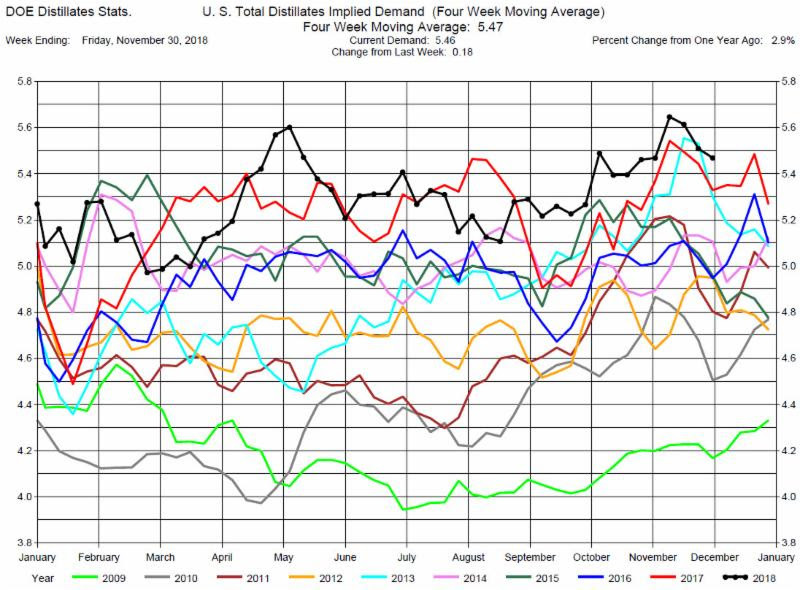 Total Distillates Implied Demand was up 180,00 barrels per day at 5.46 million barrels per day. 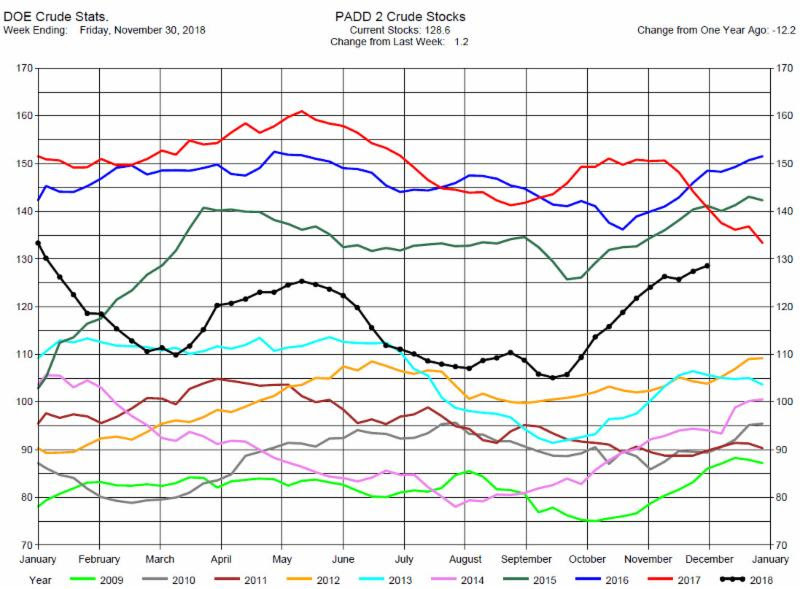 Despite the recent increases distillates stocks are low for this time of the year and demand remains at record levels so we maintain our suggestion of consideration of long positions in the Heating Oil Cracks.